The Supreme Court's decision, giving a go ahead to the Sardar Sarovar Project, has regenerated the debate. 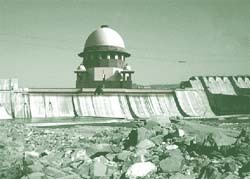 The Supreme Court's go-ahead to the Sardar Sarovar Project ( ssp ) was long overdue. It is a good judgement. It lays down the framework within which the project can continue. This will ensure that the work on the dam moves forward swiftly. The message is that it is necessary for the project to move ahead without wasting any more time. Of course, this would be subject to the safeguards to deal with concerns regarding the environment and the relief and rehabilitation ( r&r ) of the displaced people. The wellbeing of the displaced is an important issue. Based on my visits to the rehabilitation sites, I can say that the r&r work is satisfactory overall. In fact, to compare r&r work of the ssp with that of development projects in the past is like comparing apples and oranges. The r&r package of this project is far more advanced than anything earlier. It will actually lay down a model for the future. I don't know of any similar project in the world that has been subjected to the kind of scrutiny that ssp has been put through. The fact that the authorities have to seek clearance from the sub-groups for environment and r&r for every increase in the dam height by five metres speaks volumes about the kind of safety mechanisms that have been built into the process. To expect everything to happen in one go is inappropriate. Whenever a family moves house, the process of 'settling in' takes some time. In the case of those displaced by the ssp , rehabilitation should not be confused with resettlement. Rehabilitation, unlike resettlement and relocation, takes time. The reason for believing that the r&r package will work properly in this case is that the highest judicial authority in the country has laid down the policy to be under close supervision at every stage. This package provides land for land, while r&r packages of the past talked about monetary compensation. The Supreme Court has pulled up Madhya Pradesh ( mp ) for not doing enough on this front and rightfully so. The state government has been arguing that it does not have enough land to resettle the oustees. It has to be remembered that mp is the largest state in the country and the density of population is not as high as in several other states. It is a question of the state government getting its act together. The state government is acquiring land for other development activities all the time. If there would be such great shortage of land, there should be no development activity in the state. Many in villages of mp will only be partially affected in some years of high floods. In most cases, relocation of homestead on higher ground will suffice as the farmlands are not submerged. Therefore, the quantity of land required for r&r need not be as large as assumed. The financial cost of the dam has been a hotly debated issue. It is being said that the dam will not provide returns comparable to the cost. For one, the cost would go up because of the delay due to litigation. For another, as the costs have gone up, so has the value of what the dam would provide. Water and electricity are badly needed, more so today than in the past. The charges for water and electricity have also been raised. It would be wrong to throw out the baby with the basket. The Supreme Court judgement has been criticised strongly by the Narmada Bachao Andolan ( nba ). But the organisation was happy with the court when it granted a stay order on construction in 1994. Now that the decision is unfavourable, they are crying foul. Why, then, did the organisation go to the court in the first place? Having approached the Supreme Court of India, it should respect its judgement. The nba has a lot of dedicated people who have tremendous drive. Unfortunately, their energies have been misdirected. The organisation should now work with the project agencies to ensure, implementation of the Supreme Court judgement, and thereby a fair deal to the project's affected families. It was unintentional. But the message was clear. The time: 39 minutes past noon, the most auspicious moment of that particular day according to the Hindu calendar. Union home minister, Lal Krishna Advani, declared that year 2000 will be remembered for the Sardar Sarovar Project ( ssp ). Just like 1999 will be remembered for the Kargil confrontation with Pakistan and 1998 as the year of the Pokran nuclear blasts. A home minister is better off showing some homeliness. But when he makes a statement like this, you know for sure that the issue has become something of a war. What disgrace to see such a gathering of the 'victorious'! Celebrating like conquerors after vanquishing another group of people who, incidentally, also happen to be citizens of this very country. Vijay Diwas (day of victory) was declared in Gujarat -- it could easily be called Ghamand Diwas (day of arrogance). Deepawali, the main festival on the Hindu calendar, arrived one week early in Gujarat, screamed the newspapers. But why blame politicians and the media when even the Gandhians of Gujarat failed to note the despair of those who will be displaced by the reservoir? The festival only brought darkness to their lives. Reports quoted people of Nimad in Madhya Pradesh saying they will not celebrate. There was nobody apart from groups which have been protesting against the ssp . Dam or no dam, when did Mahatma Gandhi teach his followers to become this blind to the agony of their neighbours? If the verdict had been against the dam, festivities and darkness would still have been there. Only the two sides would have swapped places. Indeed, it is a war. A civil war. Civilisation itself is a victim. No constructive debates. No effort to sit and hear the other side. To spare a thought for those who are defeated. Do we live in the same country? Or do we live on archipelagos separated by water, though not by the sea? Those in favour of the dam, mainly in Gujarat, say the sc verdict is "pro-people". Those who oppose the dam say it is "anti-poor". Each side has 'people' on its side. But if you have approached the highest court in the land for arbitration, you have to accept the verdict. Or do not go in for arbitration. The court cannot be said to be pro-people or anti-people. It works on certain rules and laws. It relies on evidence on paper. It can solve disputes over material possessions. But it cannot quantify human despair. That belongs to a totally different area of human society. If it cannot measure despair in social terms, it cannot deliver what has come to be called 'social justice'. It is unfair to expect sc judges to be removed from the society that creates them. Their mental water level has to be the same as that of the society. We can debate over the Narmada today merely because our ancestors left the river in a good state. If they had the engineering prowess to make a 48 metre high statue along the bank of the river at Baragaja, Koteshwar, they could have thought of several large engineering projects. They didn't. The river flows. Before we get into any development activity, we must bear in mind that the generations to come will also need to 'develop'. Let's not insist upon doing everything in this generation itself. After all, there will be centuries after the 21st. As for courts, we like to believe they deliver justice. To avoid errors of judgement, the accused are often granted the 'benefit of doubt'. In the case of the ssp , sc did not grant benefit of doubt. Not to the thousands of victims. India's judiciary is based on the very structure created during the days of the British Raj. Its aim was to serve the interests of the colonial masters. Even today, it is entrusted with the task of safeguarding the state. In this process, it is indeed helpful to the common people sometimes. But it is erroneous to assume that a court can rectify the wrongs that lie within the system that it protects. It is extremely nave to think that the court will change the system. But is all lost? No. Traditional wisdom says it never is. It is not too late for the leaders of Gujarat to go and express their solidarity with those who stand to lose everything to rising waters. To assure them that they will not be relegated to the back alleys of India's social memory. Millions of lives displaced by development projects have already suffered in ways that will never be documented, nor understood. Whatever the material gains or losses, Gujarat does not have to lose its humanity. Those who think justice has been served should ensure that others are not denied. What about those who were protesting against the ssp ? Apart from ensuring that the displaced are not denied justice, it is not too late to do a good sound study of the problems that the dam waters and heavy irrigation might create in black cotton soil of Gujarat. They have to rely on the strength of the people. India did not gain independence due to a court order. It was the result of a great social movement.History has it that Ashok, the king whose insignia was adopted by the Indian government after independence, felt revulsion at the sight of the corpses after he defeated the kingdom of Kalinga. The government can adopt more than the insignia of Ashok. There is no reason for the debate over the dam's height to sink to abysmal levels. The Supreme Court has taken six years to return to the point it began from. There is a feeling of gross injustice and people are angry and upset about it. We are determined to fight because there is no alternative. The majority judgement reveals several contradictions in itself. Consider rehabilitation one of our central arguments. The judgement leaves it to the r&r subgroup to monitor the rehabilitation process. But, the same subgroup had failed so badly in the last six years. Why else did the court have to stop work on the dam for five years? One change the decision makes is to create the grievance redressal authorities headed by the retired judges. But, the rehabilitation sub group of the Narmada Control Authority need only consult them before permitting the work on the dam to progress. The canal network of the project will affect tens of thousands of people. A rehabilitation package does not exist for them. The families downstream of the dam are also not considered for r&r, despite emerging opinion from experiences worldwide. The judgement talks of environmental assessment. But way it envisages it makes no sense. A step by step analysis of the environmental impact of the project is not plausible. One has to look at the project in its totality. Now the designated sub-group will examine whether environment mitigation measures have been undertaken in relation to the particular height of the dam. Equating each metre of the dam's height with a subjective quantum of mitigation is absurd. The Supreme Court is not infallible. Earlier, it has reversed many of its decisions. If it fails to consider facts placed before it or if its verdict lacks logic it can be questioned and approached again. Constitutionally, the parliament can also reverse the decision. The present legal redressal system has its own limitation. At a larger level the debate is of decentralisation. But when you approach an institution for redressal there is no point in starting off without any faith. Yet people have the right to disagree. The judgement is also a setback for the water harvesting initiatives of Gujarat. The government had finally begun paying attention to it. The programme is bound to be forgotten again. The project will not benefit the drought prone areas of Gujarat. Even on paper, only 1.6 per cent of Kutch and 9.2 per cent of cultivable land in Saurashtra will get irrigated. The judgement is a big setback. It punishes the innocent. We had presented many arguments, facts and the logic to prove our point. But the verdict makes one believe the case was not decided on the basis of merit. This is a kind of corruption. The retired judges have been appointed in the grievance redressal authorities of the three states. The majority judgement says that they need only be consulted before giving a go ahead to the project. But the minority judgement suggests their certification be made necessary. Is chosing either option of any consequence? The people on the these authorities will be appointed by the state government and financed, sponsored and supported by it. The earlier report by the authorities submitted to the court was not disclosed to us. We have no clue of what it contains or how truthful it has been. And to arbitrate, beyond the Narmada Control Authortiy, the inter-state administrative body stipulated under the tribunal, there is an inter-state review committee consisting of the three chief ministers of Gujarat, Madhya Pradesh and Maharashtra and the Union water resources minister. In case of dispute within the committee the prime minister becomes the final arbitrator. In other words, it falls into the hands of the the ruling party. This provision has clearly politicised the issue. Its been done keeping the immediate interests in mind. The governing party, in both, Gujarat and the centre, is the same. We were betrayed during the proceedings of the court. The court heard us on the rehabilitation issue. But passed judgement on the debate of big versus small dams. The rehabilitation issue should not be looked at in isolation. It is also a debate of conservation of environment versus development. If the project is so big and there is no land for the displaced the project should not be allowed. No land, no dam. And to assess the project, the economic criteria must be complemented with social and environmental criteria. If the public has understood this, why couldn't the court?. The court, evidently, has its own bias. It has taken a political stance, it has favoured a particular political-ideological perspective. This is why decentralisation of polity and people rights is essential. But we cannot deny the state a role in the process. People have no voice in the existing democratic system. We have to ask for planning processes to ensure devolution of power from the centre.People's rights over natural resources must be acknowledged and the development policy recreated accordingly. Only, once the development and planning policy has been brought out should we think of a national rehabilitation act. Else it will end up legitimising displacement. The President of India, a few months ago, on the inaugural function for the golden jubilee celebrations of the Supreme Court, said that our judiciary functions like a casino. Those were strong words. The order of Justice Anand and Justice Kirpal on the Sardar Sarovar Project has, on one hand, strengthened such an image of the apex court. And on the other hand, it has burst the balloon of expectations of those who believed the courts were turning pro-poor, pro-justice or pro-environment. The minority verdict of Justice Bharucha, in contrast, by asking that the project's studies, surveys and clearances be completed, pending which the project must be halted, has not helped save the image of the judiciary. But, it has certainly helped show how strong the evidence presented by the petitioners was. The order, which any right thinking person would hesitate to call a judgement, is full of contradictions. The cornerstone of the order is that the project must go ahead as per the tribunal award, irrespective of the new information available. Place against this the fact that Madhya Pradesh, a state that bears over 80 per cent of the displacement cases does not have land for people to be displaced at the 90 metre height. The Supreme Court has rejected a number of arguments in favour of review of the project, saying that the award cannot be changed. And yet the order goes ahead and changes the decision-making process set out by the Tribunal. For example, it says the prime minister will take the final decision on the matter. Besides being extra-constitutional, this part of the order seeks to achieve through a political entity what years of deliberation have not been able to. The court kept telling the petitioners not to bring up any issues except those of r&r and environment. And yet the court has gone ahead and written an ill informed, badly worded and untruthful essay on virtues of large dams. The order says that such a petition, challenging a project once its implementation starts, should not be accepted. This, after sitting on this petition for over six and a half years and after stopping construction on the project for almost five years. The Supreme Court, through this order, seems to be saying that fundamental rights do not matter once work on a project starts. The statements made in the order about the virtues of large dams are worth pondering over. The order says, largely speaking, dams do not cause environmental degradation. The fact of the matter is that comprehensive environmental assessment is not available for a single dam of this country. There is absolutely no basis for making such a statement. More importantly, there are much better alternatives available to fulfil the energy needs of the nation. The statements made by the Union home minister, while inaugurating the restart of the construction on the dam, were most unfortunate. He not only hailed the Supreme Court verdict as the finest decision of the year, and wondered if the nba was working against national interest? But more revealing than his statements was the company he had on the dais. Jaiprakash Gaur of jp Associates, the biggest large-dam contractor in India spoke from the same dias as our minister. It was clear for whom the show was on. If you wish to acquaint yourself with the minister's company, you have to only go to any village around Kevadia Colony and utter this name in front of any tribal resident. You will find nothing but fear in the eyes of people who have seen and suffered the high handedness of this company. To top it all, the judges say that if the 'backward tribals' do not want to be developed, they may have to be compelled to taste the fruits of development? It is clear: with whatever point of view Justice Anand and Kirpal have written this order, they have not written it with a sense of justice. The order will remain a black spot in the history of democratic India for decades to come.